When it comes to computer monitors, getting a large sized model with the right resolution and technology packed into it is essential. After all, you spend hours each day staring into the monitor, and that would definitely have an effect on your eyes in the long run if you were to make use of a low resolution model. 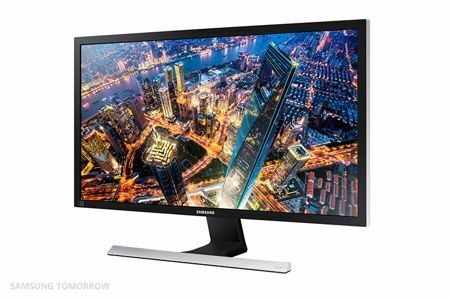 Samsung has decided to expand its family of ultra high-definition (UHD) monitors in order to better suit the visual display needs of both entertainment-focused consumers and detail-oriented professionals. This means the new UE590 and UE850 UHD monitors are capable of delivering rich picture contrast and rapid response time, resulting in a more life-like, non-distracting visual experience that simultaneously enhances performance. Depending on your organization’s need and budget, the Samsung UE590 and UE850 monitors will arrive in 23.5” and 28” form factors, where the former model is most applicable for high-quality entertainment seekers and avid gamers who require immersive visual detail. As for the latter, the UE850’s (23.5”, 28” and 31.5” models) will boast of improved resolution and dynamic connectivity drive efficiency for professional, creative and analytical tasks. Merge that with ergonomic and environmentally-friendly advancements, both the UE590 and UE850 monitors are up to the task when it comes to delivering a complete, comfortable viewing experience. Certainly Samsung is not the only player in the market where 4K monitors are concerned, but this does not mean that the South Korean conglomerate is behind in the game. On the contrary, these new models offer more than 8 million pixels and four-times the detail clarity of full high-definition (FHD) alternatives, which would translate to providing the most accurate image recreation possible. They both create a true UHD viewing experience via a host of embedded picture- and game-enhancing functions, and happen to be the only UHD monitors that support AMD FreeSync technology, which synchronizes the refresh rate of the monitor to the frame rate of a user’s AMD graphic card for a smooth, responsive and tearing-free game. As for the 28” and 31.5” UE850 business monitors, those boast of a Quad Interface that seamlessly connects with DP 2.1, miniDP, HDMI 2.0 and HDMI 1.4a sources. HDMI 2.0 and DP 2.1 support 4K resolution at 60Hz, which is double the maximum resolution of HDMI 1.4a (4K at 30Hz), now how about that? It would look like the technical specifications of these UHD monitors are more than enough to meet today’s needs – and then some.